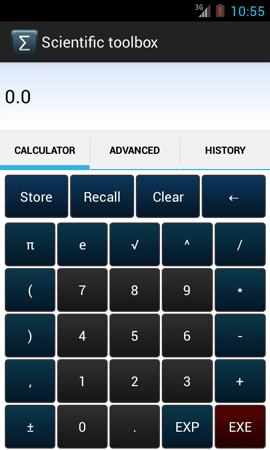 The main screen provides access to the most basic operations on the calculator. To temporarily save an expression or number, use the store button and choose one of the ten save slots. To retrieve a saved number, use the recall button and choose one of your saved slots. When a mathematical expression has been written, use the EXE button to process the calculation. 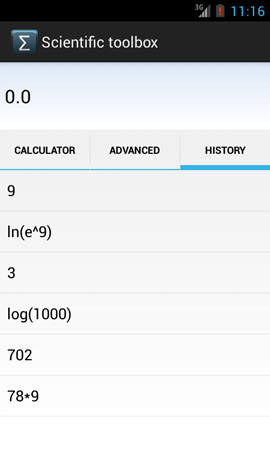 The advanced tab contains an extension of the basic operations found in the main calculator tab. To begin working with an advanced operation, tap the corresponding button and provide the necessary data. The required data is declared on the operation button. If more than one variable is required for an operation, use a comma (,) sign to separate multiple data inputs. Some operations require that a number is inputed before the operation button is tapped (such as the factorial operation). The history tab keeps account of the actions performed within the application. It helps you trace what operations you executed recently. 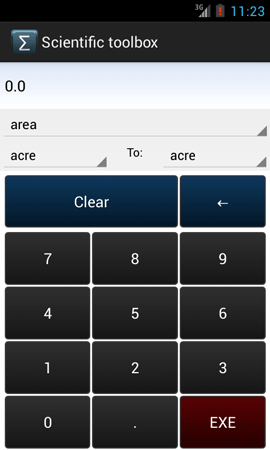 The formulas screen can be accessed through the application menu and is used to open various parts of the formula reference. 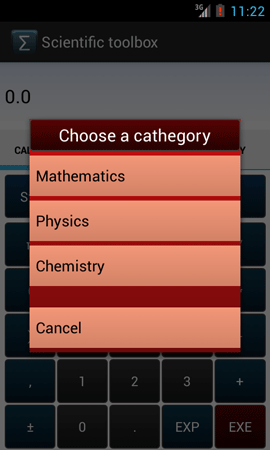 To open a specific section, simply tap the corresponding button and a list of specific topics from the chosen subject will appear. Choose an element from the list to view the explanation for the formulas included in the picked topic. From within the unit conversion screen you can see many common units for a certain quantity. To start converting units, simply choose a quantity and pick the starting unit and the unit you want to convert to. Then, assign a starting value using the numerical keypad and press EXE when you are ready to proceed with the conversion. If you want to remove everything in the input field, use the clear button. 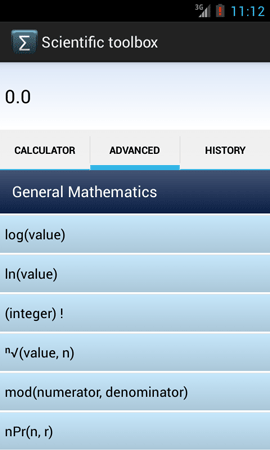 The settings screen allows customization of multiple alternatives regarding the operations of the calculator. 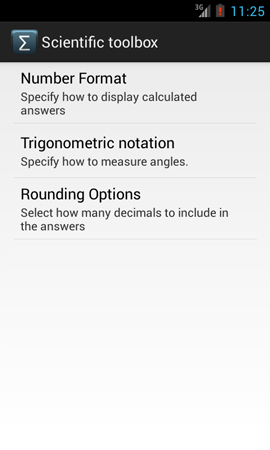 You can specify the format that the calculator uses to answer your mathematical expressions and choose how you want to measure angles in trigonometric operations. You can also set custom rounding rules.